Can't make it to our Classic OzSky Star Safari in April? Or have you already been to several OzSky Star Safaris and you're now looking for a different time of year to explore the other half of the Southern night skies? In addition to the exclusive "Classic" OzSky Star Safaris scheduled in April each year, and driven by the increasing demand for a second annual OzSky event each year, we are now offering an alternative 7-night observing adventure during "Southern Spring" (October 6 - 13, 2018), providing access to the opposite half of the Southern Sky to that which is available during the "Classic" OzSky Star Safaris in April. The newly re-vamped OzSky "Southern Spring" Star Safaris are limited to a much smaller group of only 12-16 observers, and will be held at Markdale Homestead - a completely different location to the classic OzSky Star Safari to give our OzSky "Alumni" colleagues a change of scenery, and is also more suited to a smaller group where we don't need to book and fill the entire motel in order to be able to guarantee onsite darkness. We ran a number of trials of this event and location in October 2015, 2016 and 2017, and their success lead to the decision to run this "Southern Spring" event on an annual basis during that time of year. The "Southern Spring" edition of the OzSky Star Safari has been designed to be a far more relaxed, "no frills" OzSky-style observing experience with a much stronger focus on observing and much less focus on touring and organised day trips or activities. 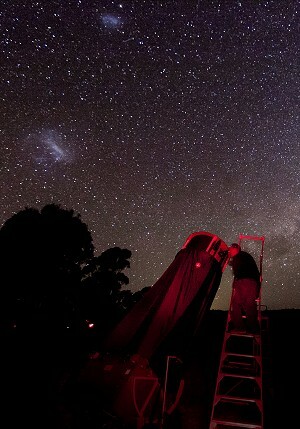 Whilst the OzSky "Southern Spring" Star Safari is a significantly smaller event than the "Classic" OzSky Star Safari, a range of up to four (4) large telescopes including a 30", 25" and two 18" telescopes will still be available for the use of those attending. The final selection of instruments will be guided by the choices of those attending the event, but also by the availability of volunteers to transport those specific instruments to the observing site. Following a number of recent requests, we are also now offering a package deal with the "Southern Spring" event which includes both your OzSky registration fees and your on-site accommodation expenses all in one single up-front fee structure. So, if you're a seasoned OzSky veteran who has already explored the Southern Autumn/Fall (April) skies with us a few times and are now looking to delve deeper into the Large and Small Magellanic Clouds (LMC/SMC) as well as some of the more challenging southern objects best observed later in the year, or if you've never been to an OzSky Star Safari before and simply can't make it to one of the "Classic" OzSky Star Safaris in April, this 7-night southern skies observing adventure could be just for you! If you are interested in joining us at the 2018 OzSky "Southern Spring" Star Safari, please complete and submit your 2018 OzSky "Southern Spring" Star Safari Registration Form as soon as possible, as numbers are stricltly limited to the first 12-16 registrations received and confirmed.